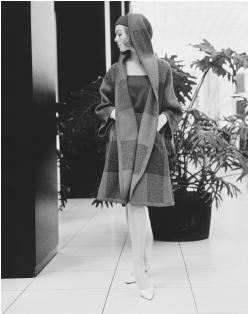 Bonnie Cashin, 1962 collection: suede and wool coat with a jersey dress. 1937-43 and 1949-52; costume designer, Twentieth Century Fox, Los Angeles, California, 1943-49; designer, Bonnie Cashin Designs (with partner Phillip Sills), New York, 1953-77; established The Knittery, 1972; founder, Innovative Design Fund, circa 1981. Exhibitions: Brooklyn Museum (retrospective), 1962; Metropolitan Museum of Art, 1997; Fashion Institute of Technology (retrospective, "Bonnie Cashin, Practical Dreamer"), September 2000. Awards: Neiman Marcus award, Dallas, Texas, 1950; Coty American Fashion Critics award, New York, 1950, 1960, 1961, 1968, 1972; Sporting Look award, 1958; Philadelphia Museum College of Art citation, 1959; Woolknit Associates Design award, 1959, 1961; Lighthouse award, 1961; Sports Illustrated award, 1963; Detroit Business Association, national award, 1963; the Sunday Times International Fashion award, London, 1964; Leather Industries American Handbag Designer award, 1968, 1976; Kaufmann Fashion award, Pittsburgh, 1968; Creator citation, Saks Fifth Avenue, 1969; Mary Mount College Golden Needle award, 1970; Hall of Fame, 1972; I. Magnin's Great American award, 1974; American Fashion award for furs, 1975; Drexel University citation, Philadelphia, 1976; inducted to Fashion Walk of Fame, Seventh Avenue, New York, 2001. Died: 3 February 2000. Levin, Phyllis Lee, The Wheels of Fashion, Garden City, New York,1965. Milbank, Caroline R., Couture: The Great Designers, New York,1985. Milbank, Caroline R., New York Style: The Evolution of Fashion, New York, 1989. "Bonnie Cashin: Trail Blazer in Fashion," in American Fabrics (NewYork) 1956. Reily, Robert, "Bonnie Cashin Retrospective," in American Fabrics and Fashions (New York), No. 60, 1963. "Bonnie Cashin," in Current Biography (New York), May 1970. "Round Table: Bonnie Cashin," in American Fabrics and Fashions (Columbia, South Carolina), No. 133, 1985. Elliott, Mary C. "Bonnie Cashin: Design for Living," in Threads (Newtown, Connecticut), Oct./Nov. 1990. Weir, June, "Natural History," in Mirabella (New York), January 1995. Wilson, Eric and Janet Ozzard, "Designer Bonnie Cashin Dead at84," in Women's Wear Daily, 7 February 2000. Obituary, in the Economist, 12 February 2000. Scully, James, "Cashin' In," in Harper's Bazaar, July 2000. Wilson, Eric, "Bonnie Cashin's Inspiration," in Women's Wear Daily, 18 September 2000. Spindler, Amy M., "Design for Living," in the New York Times Magazine, 7 January 2001. An awareness of the body in motion informs Bonnie Cashin's design style. Her earliest efforts were created for dancers: as a California high school student, Cashin costumed the local ballet troupe, Franchon & Marco. After graduating from high school, she became the company's costume designer and later, with the encouragement of the troupe's manager, moved to New York to study dance and take classes at the Art Students' League. Soon after moving, Cashin began making costumes for the Roxy Theater, which during the 1930s was a major competitor to Radio City Music Hall's Rockettes. An article in Variety described Cashin as the "youngest designer to hit Broadway." During her tenure as house costumer with the famed Roxy Theater, which she considered her "formal schooling in design,"she designed three sets of costumes a week for the Roxy's chorus of 24 dancing showgirls. With minimal budgets, Cashin used her ingenuity, a little paint, and knowledge learned from her mother, a custom dressmaker, to transform inexpensive fabrics into striking costumes that looked equally graceful in motion or in repose. Whether for stage or street, Cashin's work has always been styled for the active woman on the move, who prefers an easy, individual look with a minimum of fuss. The May 1970 issue of Current Biography quoted her as saying, "All I want is to speak simply in my designing; I don't want the gilt and the glamor." A 1937 production number, in which the Roxy dancers emerged smartly dressed from between the pages of a fashion magazine, sent Cashin in a new direction. Louis Adler, co-owner of the sportswear firm Adler and Adler, saw Cashin's designs and recognized her potential importance to the fashion industry. Wary of the garment district's regimentation, Cashin initially played it safe. She stayed on in the familiar collegial world of the theater and freelanced for Adler. In 1938 Cashin left the theater to work for Adler, quickly earning a name in the ready-to-wear fashion circles. When the U.S. entered World War II, Cashin was appointed to a committee to design uniforms for the women in the armed forces. Her designs for the mass-produced uniforms were practical—they were protective, comfortable, and allowed for freedom of movement. The uniforms were made from long-lasting fabrics such as canvas and leather, featuring large pockets, toggle fastenings, and industrial-size zippers. Eventually she signed with the firm and designed for about 12 years before and after World War II. After a brief marriage to art director Robert Sterner, and having become frustrated with the Seventh Avenue fashion scene, Cashin returned to California where she exercised her talents in a completely new arena—the motion picture industry. Cashin began working for Twentieth Century Fox in 1943, where she designed wardrobes for more than 60 films including such classics Laura, Anna and the King of Siam and A Tree Grows in Brooklyn . In 1949 Cashin returned to New York and began designing again for Adler and Adler, and the following year won both the Neiman Marcus award and the first of five Coty awards for a prototype of her signature Noh coat, an unlined, sleeved or sleeveless T-shaped coat with deeply cut armholes to wear singly, in combination, or under a poncho or cape. Despite this success, Cashin sensed she would never achieve her creative best working under contract in the profit-oriented canyons of Seventh Avenue. She began designing on a freelance basis in 1953, creating Bonnie Cashin Designs from her studio, which was located across from the Metropolitan Museum of Art. Unusual for the time, she worked on a royalty basis, creating complete coordinated wardrobes— accessories, knits, capes and coats, dresses, and separates—to be combined in layers to suit the climate or the event. On a trip to Japan during the early 1950s, the practical aspects of the kimono, a garment consisting of a variable number of layers, was described to Cashin. In terms of the ever-changing weather, the kimono was especially appropriate for cooler temperatures or what the Japanese described as a "nine-layer day." Upon her return to New York, Cashin "introduced" the concept of layering garments into Western fashion. Of course, people around the world had been dressing in layers to accommodate the climate for centuries, but as an obituary in the Economist explained, "Fashion writers are ever grateful for something that looks new, and for a while layering was praised as the big new idea." As Cashin had so aptly explained to one reporter, "fashion evolved from need." Cashin's unusual ideas were welcomed and she typically worked years ahead of the market, pioneering clothing concepts which today seem part of fashion's essential vocabulary. In the 1950s when most women's clothing was concerned with structure, the Cashin silhouette was based on the rectangle or the square and called for a minimum of darting and seaming. Cashin showed layered dressing long before the concept became a universal option; she brought canvas boots and raincoats out of the show ring and into the street in 1952 and she introduced jumpsuits as early as 1956. Signature pieces included her Noh coats, funnel-necked sweaters whose neck doubles as a hood, classic ponchos, and such innovations as a bicycle sweater with roomy back pockets. Other Cashin hallmarks were her use of toggle closures, leather piping, and pairing various fabrics such as tweeds with tartan plaid or suede. Other notable Cashin "icons" were her leather coats and jackets made by leather manufacturer Phillip Sills. Cashin introduced handbags into her collections as far back as the 1930s, and in the early 1960s designed bags for Coach. She also created rainwear designs for Modelia and gloves for Crescendoe-Superb. For several decades Cashin created a myriad of fashion items and has been identified as a pioneer of American sportswear design. In 1978 New York Times fashion writer Bernadine Morris called Cashin "an American fashion institution." She was recognized with some two dozen awards, was a featured designer for one of Lord & Taylor's "American Design Rooms,"and influenced fashion industry giants. Cashin professed a "profound distaste" for the fashion industry and retired in the mid-1980s. She died in February 2000 at the age of 84. Several months after her death, a retrospective of her work, entitled "Bonnie Cashin, Practical Dreamer," was organized at New York's Fashion Institute of Technology. The retrospective featured Cashin's most identifiable creations along with several personal artifacts from her apartment; where she was among the first to move her work space and living space into the United Nations Plaza during the 1960s. Even before her death, many of her fashion items came to attention of collectors and in 1997 some of her clothes were exhibited at Metropolitan Museum of Art in New York City. According to the exhibit catalogue, Cashin's designs reflected "democracy's magnitude and the consequence of independent and intrepid women." Bonnie Cashin worked to her own brief, designing for women who were smart, active, self-aware, and, like herself, of independent mind. The research in the above entry is incorrect on several key points: Cashin was born in Fresno in 1908, not Oakland im 1915, she never studied in Paris, never studied dance, did not design garments featuring leather and industrial zippers for WWII (and the uniform she did design was for civilian workers, not members of the armed forces) . . . I encourage you to correct the above and/or contact me at any time for an accurate biography.